The Black Lightning series has remained pretty much a street level show, but there have been plenty of teases for bigger things to come. We've seen the introduction of Dr. Jace, plus dealings with the country of Markovia and a project labeled Masters of Disaster. It looks like we may be leading towards an Outsiders type team. I'm hoping that will be an angle for the third season. "Jefferson Pierce has had it out for the Kingpin..."
Um, shouldn't that be "had it IN" ? *Delivered discourtesy of one of Syonide's poison blowdarts. 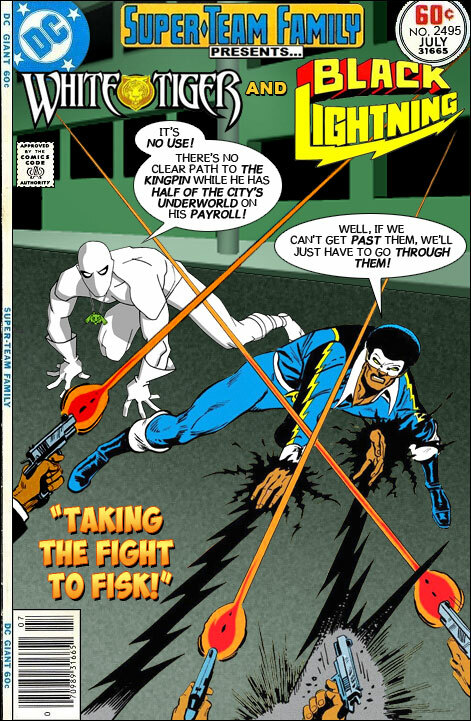 Good follow up would be adding Bronze Tiger to help against Fisk. The have a distance/shooter (BL) and close-up/speedy (WT) fighter. What they need is a flyer. Hawkman, Falcon, or Birdman. Ross, are the comments going to be OK when Google+ goes away in a couple of months? I deleted my Google+ profile the other day and it switched me over to my plain Google account when I commented today. I have no idea how Google+ going away will affect the blog. I hope it doesn't just vanish! "The have a distance/shooter (BL) and close-up/speedy (WT) fighter. What they need is a flyer. Hawkman, Falcon, or Birdman." Keep the 'colours-in-names'aspect: Blue Falcon. I miss the original WHITE TIGER. I remember his early fights and then team-ups with SPIDER-MAN as well as The PROWLER. The character has so much unrealized potential for Marvel. @Simreeve: Blue Falcon can't fly, dude. He's basically a more colorful Batman. Do you have the budget ready for the next Fisk-al year? I've always been of the belief that Blue Falcon was Birdboy all grown up!